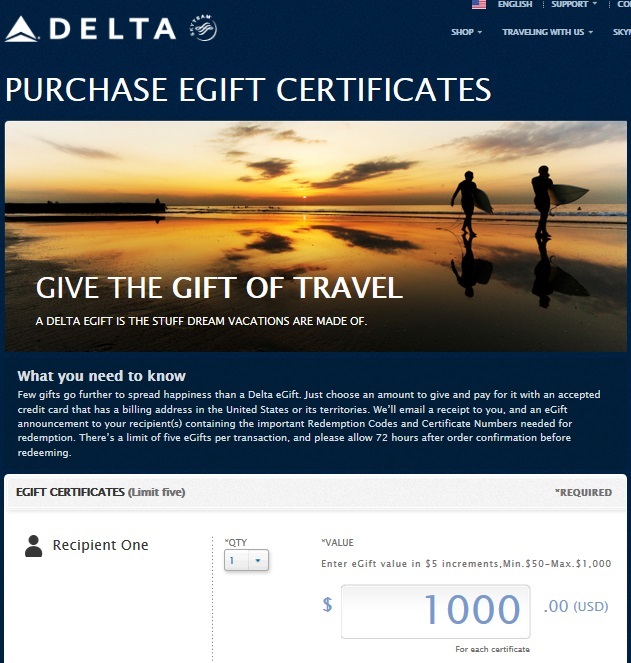 Delta launches e-Gift cards up to $1000 each and 3* per ticket! So, say you have 3 – $500 e-Cards but your ticket is $2000. Then, you would have to use 2 of them and your credit card for the rest. Clear? All the T&C are on the Delta site or you see a text copy of them here. … and so many more perks as well! Will purchasing these cards count toward MQD’s? @Ryan – I think both Yes and NO (at this point). My guess is NO from Delta side (ie say $2500 ticket spend) but YES from AMEX side for $25,000 spend. 1. Can you give an e-gift to yourself? 2. See if you can verify the Amex credit back. Has to be readers who can help you out who have the card. Handy way to meet min spend on a churn. @THEsocalledfan – Can not confirm either one yet as this is 1 day old so far! I must be very dumb — why buying a gift card is so good? To me this says you can only use ONE certificate per ticket, but it’s not clear if they might mean one TYPE of certificate, or one or more certificates of any SINGLE type can be used per ticket, or just one certificate period. @Stan: Buying a Delta GC in and of itself is NOT the deal. Meeting CC spend and/or reimbursement by AmeX Plat is the good deal. Has anyone confirmed that CC spend can be met by these? Awesome thanks for posting. Headed over to make my $200 purchase on Business Platinum to get my $200 credit. Making my weekend! What’s the 100$ back on card? So Rene, the “win” of these e-certs is getting Amex Platinum to reimburse $200 of the expense as “fee” spend? Or is it something else? Wrong question: I meant to ask has any confirmed that Amex Platinum $200 credit can be met by these. @GORDEN – please report back to conf. @Brabbit – when you pay for GOES or global entry fee with card. Delta blogger: please advise your readers not to go calling AmEx and potentially ruining what has been a very good benefit on the AmEx plat. The airline giftcards are technically not what the credit is for, but when purchased — for almost any airline — they have been credited back within a week on the AmEx plat. Since you can use 3 forms of payment for Delta and Delta code now………maybe you can stir the pot and allow 3 delta vouchers for a single ticket ? My thought process is……..whatever we can squeeze out of Delta/AMEX……..I am going to squeeze…….They have squeezed us extremely hard lately, and continue to do so………..what’s next ? carges for Blankies and Diet Coke ? Why is $50 the minimum amount? Wouldn’t you get more business if you offered a $25 gift card? Would this count as airfare? Thinking of Amex Premier Rewards Gold 3x. How can I see the amount remaining of my $200 annual credit? Any ideas if the 100k MR points on Platinum will be back? I missed it the last time, just not sure if it was a regular seasonal offer they had or a one time special deal… I’d like to hold out to get that along with the credits, GEOS, etc..
Can you buy these yet? or is the site still broken? @E – have not tested yet. Will advise and try soon. got a $50 yesterday, will see if Amex cred. is applied. Posted Sat. as Delta Airlines Atlanta on AMEX PLAT Statement. Waiting for good news, hopefully? I purchased a $50.00 e-Gift card Friday, May 10 on Amex Mercedes Platinum. Coded “Travel-Airline” which according to TPG, is not a good sign. So far, no credit. Sweet! The A. team came thru today for $50 cred. Anyone get the love at $100 or $150? I’d like to go for a $150, rather than 3 more at 50. So now apparently you can use 3 eGift cards (or 3 eGift certificates)and a credit card for payment. BTW, I just got my airline fee credit on my platinum Amex for my $50.00 eGift certificate! @MrMoonlight – I think you are not quite right. It is 3 total payment items. I think the way I posted is correct but if someone can use 3 of these gift items AND ALSO use a credit card for the rest let me know! I purchased a $75 certificate yesterday (May 15th), I’ll post back if I get credit. @Rob – my thanks for the test and feedback and help with the blog. Mean a bunch! @Rene – Respectfully disagree. . . Sorry! What i was saying was that the t&c you cite doesn’t say that anymore! It has been changed.. It originally limited you to a maximum of three forms of payment which would mean you can apply a maximum of 2 egift cert/cards and pay the balance with cash or plastic.That restriction no longer appears. Instead it says you are limited to thee certificates or cards. That seems to me to say that you can use 3 egift card or 3 egift certs toward your ticket but that doesn’t prevent you from paying the balance with cash or a credit card. @Rene – you do see that they change the t&c you cited, correct? I don’t see anything in the new language preventing you from using the credit card AND the third cert if the third cert was not enough to cover. Am I right? :). @MrMoonlight – you are right, they really did change the wording a bunch. To me it is less clear and in the past, way way back, you could use up to 3 certs and then a credit card for the rest. It seems that you are right and they have with these at least gone back to that way of doing it. This really is good news if that IS the case. We will see (ya know ya never know until ya try)! @MrMoonlight – HA – let me know how it goes. Can’t wait. Oh our deal Delta. And, as we both know, if one says NO, then we call back, as next one will say YES! I bought 4 – $50 e-gift cards this week with my Plat Amex and the $200 has already been deducted from my account. I still need the cards to show up in my mail. I tried a $75 eGift cert on 5/15, no credit yet. I tried a $50 eGift cert last night (5/23) to see if a smaller value has any luck. Seems like $50.00 is the sweet spot. The $50.00 eGift cert I purchased on May 10th, posted on the 11th and I got my credit on the 13th. I then purchased a $95.00 eGift card on May 14th, still no credit. I’m still trying to find a way around this! Since the airline fee credit is now apparently limited to $50.00 eGift certs, and we can apply a maximum of of 3 eGift certs per purchase, can we split our ticket purchases to get the maximum usage? For example, let’s say I have accumulated 6 $50.00 eGift certs, and I want to book 2 award tix using my SkyMiles, with a total of $300.00 in taxes/surcharges. Is there any reason why I would not to have this “rung up” as two separate purchases, and apply 3 $50.00 eGift certs to each ticket? @MrMoonlight – I have not in real world tested the new verbiage that you can use 3 eGifts+CC to pay. There should be no reason (well other than Delta “IT” and Delta reps) that you could not use 6 on one PNR if there are two people flying. #Developing! Answering my own question: T&C say the limit is 3 certs per ticket. So it doesn’t seem to be an issue if you get a ton of $50.00 eGift certs. You can apply three each toward each ticket, and have that cover any surcharge or tax up to $150.00 per ticket. At least that’s the way I read it! I’m going to buy another one! Another update…I just got credit for my $50 eGift cert purchased on 5/23. Still nothing for the $75 cert purchased a week prior. I just tried another $50 cert, hopefully I’ll have the same luck. Eob thanks for posting. i too am trying for 2nd 50 cert. Wanted to try a 100 but that looks like NG. Thumbs up on round 2. UPDATE: Purchased $50.00 eGift cert May 25, received credit today, May 29. Good thing I did. 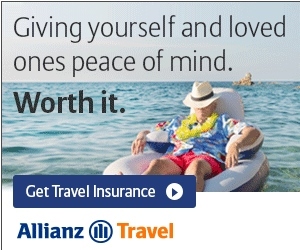 Otherwise, I’d wind up buying a lot of drinks for other passengers on my next flight trying to use up my credits! So this card is for people without any amex? @wei – yes for someone w/out a membership rewards card yet or if it has been 365+ days since you canceled one to get new card bonus again. @tyrone – Txs for data point. My wife and I have over 100,000 points saved up to help book a trip to Hawaill and along with Delta vacations Gifts cards to pay most of the purchase How many Delta Vacations gift cards can I use at one time? @Richard – You can use any size 3 Delta gift cards per ticket plus a credit card and that is what Delta.com says.